Solid metal outer and inner rings. temperatures. Suitable for raised face or flat face flanges. Prevents turbulences and protects the flanges from erosion. of the gasket element from the fluid. 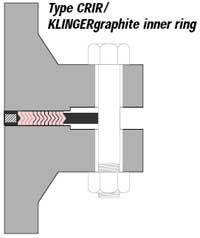 Solid metal inner ring with KLINGERgraphite facing. For use at high pressures and temperatures.